They are nearly done and working on it regularly. Not nearly at all....the top backside of the podium parkade where signage was has not been done, nor the entire podium. Or for that matter repair or cladding of the exterior of the parkade including the large blank wall where they removed the big signage of the word Chateau Lacombe. Podium and roof area of podium won't be done until late summer 2017 at the rate they are going. That parkade is looking rough. The slow pace isn't cool. Calm down everyone... they are likely cashflowing the renovation into multiple fiscal years so they don't go bust. I'd prefer they stay in business than pay a rush premium they can't afford. ^^^The tower is what we are talking about, I am not even sure if the parkade or podium is being done. 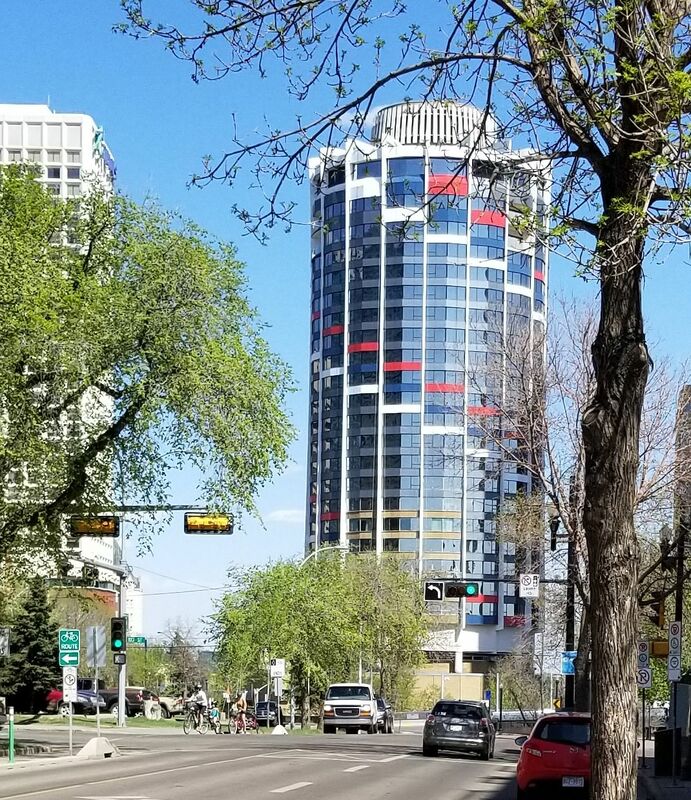 Maybe the Journal could do a feature on what is happening with re-imaging projects in Edmonton...and flush out some information on how extensive the renos will be. Lots of buildings being updated - that is a good news story. While busy falling asleep with this project I nearly missed this. Good that the tower is getting an energy refit, but would dearly love to see a sidewalk cafe on MacDonald Drive. Years ago there was one. They created a coffee bar, with baked goods etc. on the east main floor that looked out into the traffic circle. Problem was vehicle traffic in the round about and frankly lack of customers. Only people buying were those that parked there and some hotel guests. Looks like Chateau Lacombe exterior redo has resumed this week, working on the last section. Maybe they'll finally finish it this year. 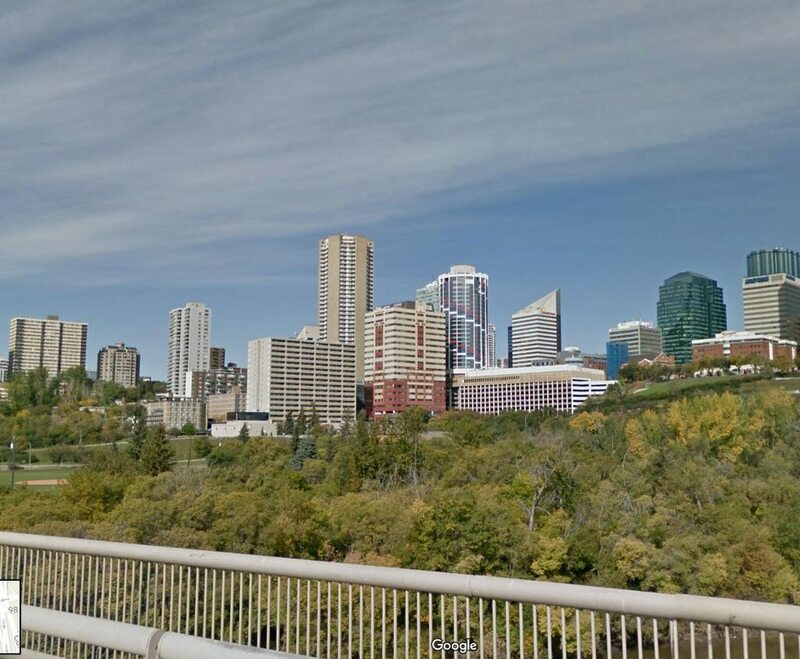 I'm starting to think the Walterdale Bridge project will finish before this reskinning work. When rolling into the valley from the SE, the barber spiral really stands out as a sore spot on the skyline. Yeah. I mean, tastes vary, but I really think that building was meant to sport the biege tones that it was originally built with. Why is this Reno taking so long? Are there plans to do the parkade and lobby area? Those areas really need it. 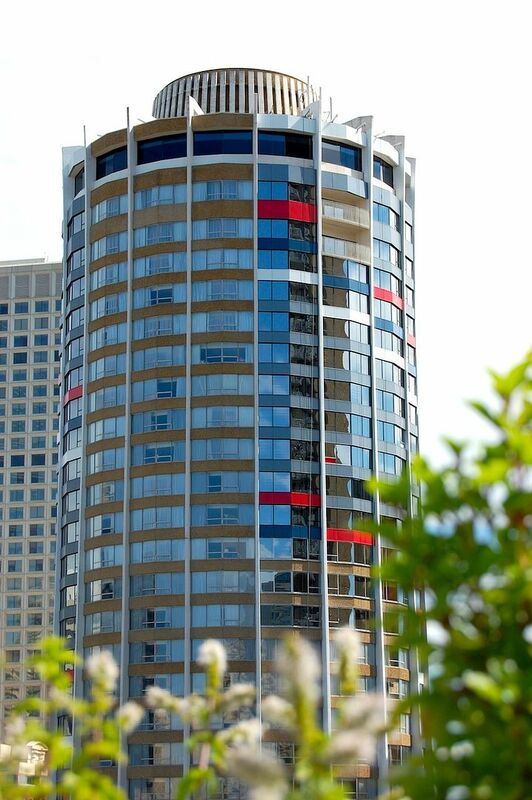 The reno would be fantastic if it was all the darker grey and dropped the red, white, and blue. I agree completely. The property has zero curb appeal for travellers or for resale. The guy that owns it put his own personal thoughts on what it should look like - and we have a pig now - one in which he seems to have left with half its lipstick on. How the owners thought those colours would look good is beyond me. A smart developer owner would never personalize - he would defer to a top architects design vet designs with top tier realtors for resale hotelier purposes. So he didn't and now we have The Barber Pole on Bellamy. And so it shall henceforth be known: The Barber Pole on Bellamy. Hahaha. Which, given the Hill's longstanding reputation for certain commerical transactions, could become a nickname for a kind of "service" available in said environs. The mirrored windows looks so much better than the clear ones that show the curtains. Any pictures of the interior renovations? I like it myself. Looks nice. My wife booked a room there on my last birthday it had new paint and new carpet just installed. That was all I could notice. Our room still had the old windows but that section is done now. It was a SW room. 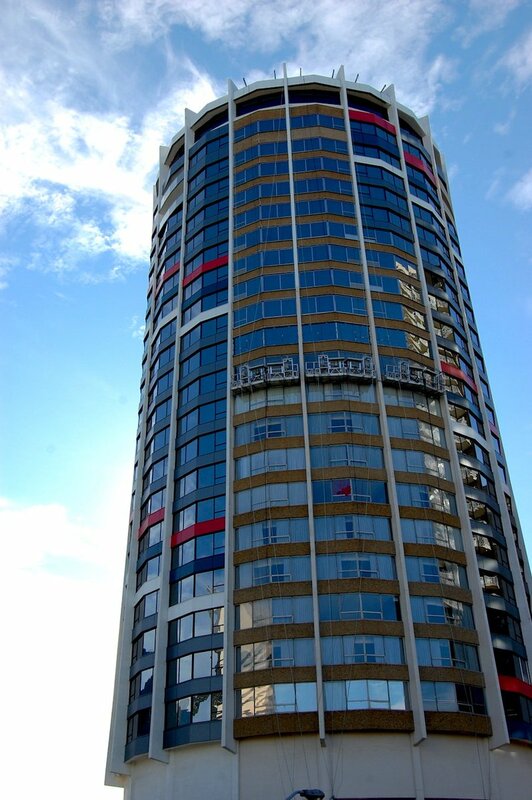 We enjoyed the revolving restaurant and were in for about two hours. Sonny Boy really enjoyed it. The food and service was great. I hope they are changing the lobby somehow or sprucing it up somewhat. Just seems so dated, well I guess the whole place does somewhat. 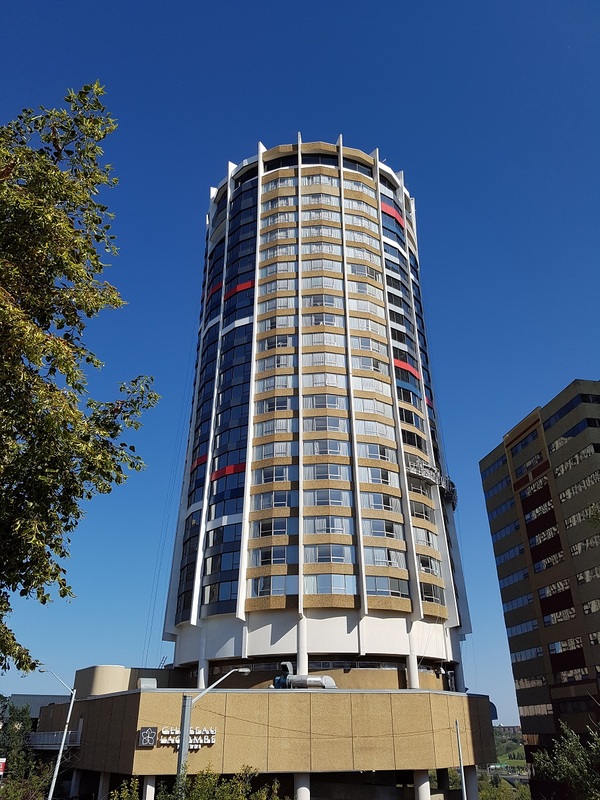 My wife says next time we go to the revolving restaurant for our evening out we will get a room elsewhere and walk over. She was unimpressed. Last edited by Drumbones; 23-05-2017 at 07:33 AM. I think it looks great. 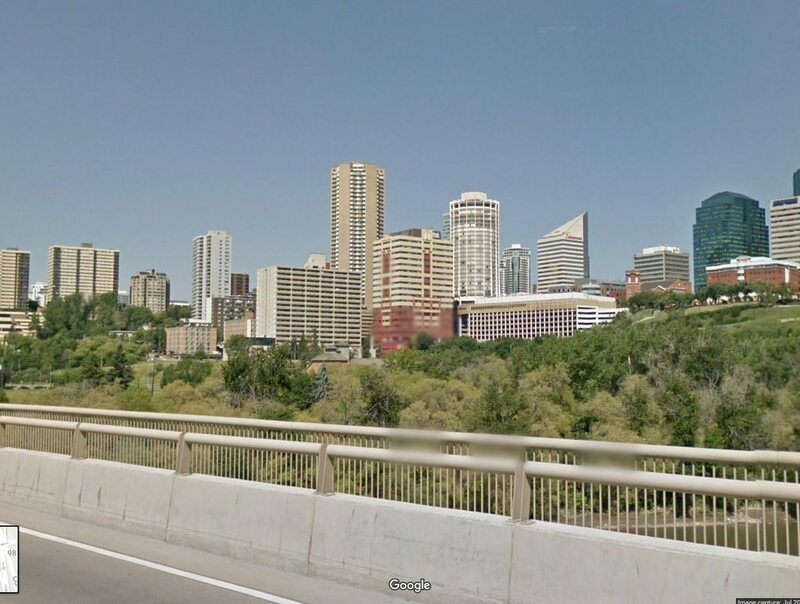 Once it's done it'll be a nice change to our drab skyline. I have to admit, while dubious at first, its really growing on me. Does add some variety and colour. Now if only that parkade received some love.. It's more of a resignation than an acceptance or appreciation. 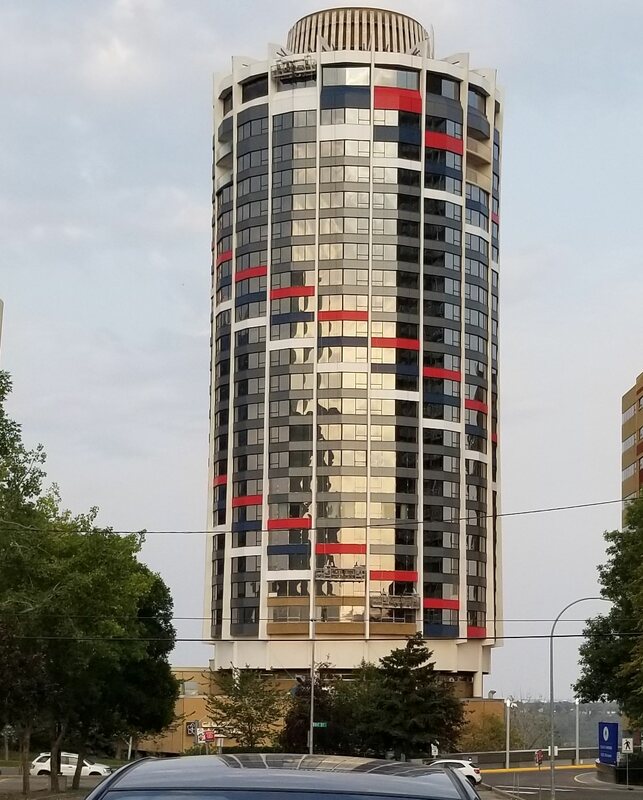 I'm not overly keen on the Serbian flag color schema but overall the reclad looks much better than the typical Edmontonian Soviet-era concrete bunker look. Just wish they'd finish the damn thing already. I like it as well. Just wish they would finish it and update the parkade and lobby. Side by side...two facade reclads I do not like. The dark grey for the Lacombe would have been nice. 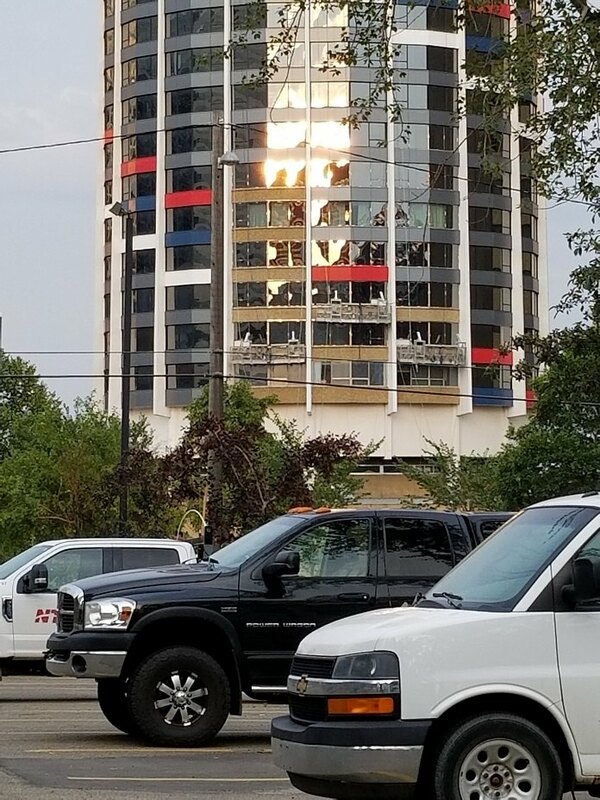 That other building, park square?, all bad. Park Square is not a reclad. It's a paint by numbers project. I wouldn't want a skyline full of Chateau Lacombes but one is a nice change from the ordinary. Just like I wouldn't want everything clad in the same colour glass as Manulife. Variety is good. 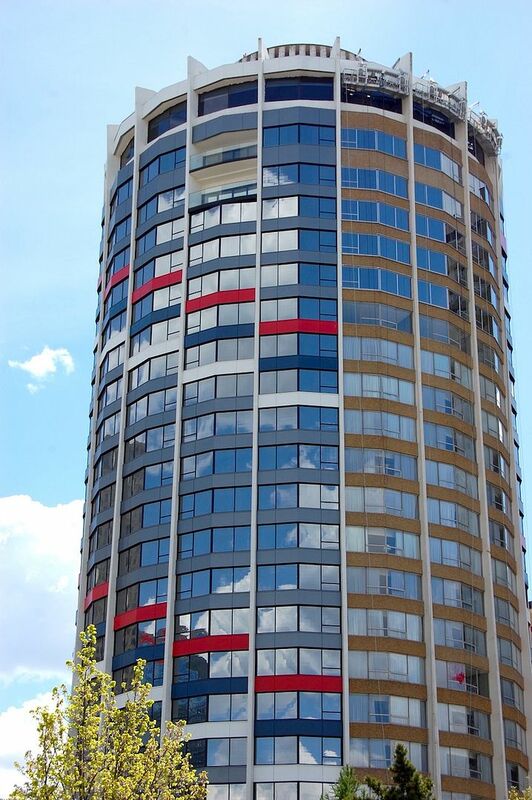 I wonder when they reclad the parkade will they put on colored panels on an angle too? Was it announced they are updating the parkade? Ditto. We did go a bit overboard with the 1960's/70's beige concrete thing here. A bit more variety dowtown is good even if the colour scheme and layout seems a bit eccentric. Probably because so much of the buildings were built in the 60's and 70's. Nope the parkade recladding wasn't announced, however more than one panel is missing chunks of concrete, I wonder at what time the city will demand them to do something for safety concerns. My understanding (and I could be wrong) is that the previous owner sold the parkade to a third party. As we found out when we booked a room there and upon leaving were charged an extra $20 for parking. Pizzed me off. I like what MacLab did with the parkade at Edmonton House. Great design and install in the panels. ^yeah it doesn't look bad. i have a hard time picturing what could be done to that parkade though cause it's in really rough shape now. It's such a beast. My guess is the owner won't do a thing unless forced to for safety reasons. Strange that the parkade is privately owned and will continue to deteriorate - guests in the hotel that park must be disgusted. The parkade is filthy at best and visually appear as if it could fail in a few places. Not a great shot, but you get the idea. Still no updates on the Chateau Lacombe reskining for over a month now. The owner must be collecting more cans and bottles to pay for the work. At the rate this is going, they should finish this by the turn of the decade! But unfortunately not Dub quality. Remember that the Dub spectrum goes from City Hall to Baccarat Casino. Pleeeeeeeeenty of range there to cover just about every project in town. Last edited by EdmTrekker; 11-07-2017 at 01:20 PM. 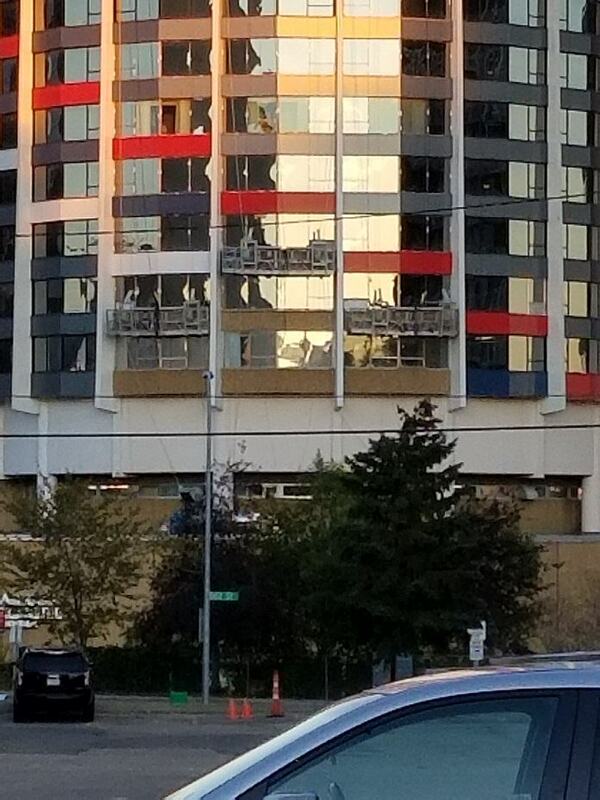 Ramada finally pulled the flag from their Kingsway hotel. It is now simply the Edmonton Inn & Conference Centre. That property needs an inside-out total renovation. Such potential but so dated. Back to the days of yore. My (older) sister worked at the Edmonton Inn in the late 1960s I'm thinking. Anyone know what year it was built? Edmonton Inn & Conference Centre need to reimagine the buildings and purpose - they could create an urban market in their courtyard and expand out the back - that would serve Blacthford if they do it right. They could also add multiple theatre spaces. That whole complex has a ton of potential given the adjacent development. I hope there are major bikeways and pedestrian paths into the hotel complex - assuming it is recast and becomes a community go to place. Lots of work this week. Coming up on about 3 years of this project. Excited for this reskin to be done and i hope they have something in store for the parkade. Can't say it any better than this. Don't want Miami art deco for DT, but a splash of colour here and there is a relief. Have the finished installing the new exterior finish yet? Faster or slower than Dub? Still faster than Dub according to my reckoning. Chateau window replacement began Oct 2014 whereas Dub's Edge first had shovels in the ground in March 2013. So...are they gonna finish this decade or what? ...end of the month I am told...ish. Still so very little or no movement. I hate it...but whatever it’s still better. Nice to see continued investment in our core. Way too long, I wonder if other cities would have to wait this long for the completion of a much needed re-do. Do they order it from Korea? Are they also renovating the inside? Final shipment or more like a payment system- afford what you earned that quarter? This is like two years now. Dear gosh, lets pray these guys and Dub don't ever team up. ^^the rooms have all been done and look great. Some of the common areas are updated as well. By the time they finnish, the first pane of glass they installed will be old and need to be replaced. Last edited by ThomasH; 02-08-2018 at 06:23 PM. Didn't this started before Stantec? Nearly always more difficult and more expensive than a complete build. This is often why people balk at the rebuild policy on their home insurance. I have complete faith it will be finished as soon as possible. It’s in the owners ultimate best interest. Would this re-no have taken this long if we were considered a “tourist” destination? I don’t think so. It can occur that way. I was refering to the claddings alone which started twi years ago. Stantec started from ground up, and it is almost enclosed. Anyone know what the City is doing with the staircases east of the Chateau Lacombe. One is ripped out entirely. they were in pretty rough shape in some places, so I would assume a full replacement. Hopefully with a bit more lighting as I know a lot of people who completely avoid those stairs after dark since people like to congregate in some of the unlit sections. Meantime, looking forward to the exterior of the Lacombe finally getting finished. Last edited by Sonic Death Monkey; 20-08-2018 at 10:25 AM. The same with JWL and Stantec though. Paint the CAP and the rooms with balconies and thats it. Once the tower portion is done, they will likely update the exterior on the main floor as well. There has been a small test section with the same coloured cladding on the main floor exterior that's been there for a couple years now. They are working on it now. Still no movement on the exterior. What a joke! But some good news, they finished implementing some new tile out on the front sidewalk. Last edited by Sonic Death Monkey; 14-10-2018 at 02:51 PM.